When you are staying in the Apache Junction Arizona area give us a call. We can provide you with Apache Junction Arizona Balloon ride information. We have also included some interesting background about the town below. After you book your Apache Junction Balloon Ride with us, be sure to check our directions page to see how convenient we are to the entire valley. Apache Junction has many cool things to do. Get out there and explore. But make sure you leave time for a balloon ride with us! Apache Junction is located just South West of the Superstition Mountains. The History Channel did a multiple very interesting episodes of the magical mountains. Even though the story has been told all over the world, it posses many different versions. These majestic mountain rages not only demand respect, they play on peoples minds from the youngest child to the oldest child ripened with wisdom. The Superstition Mountains, popularly referred to as “The Superstitions” or “The Supes”, are a range of mountains in Arizona located to the east of the Phoenix Metropolitan area. They are anchored by superstition Mountains , a large mountain that is a popular recreation destination for residents of the Phoenix Arizona area. The mountain range is in the federally-designated Superstition Mountain Wilderness Area, and includes a variety of natural features in addition to the mountain that is its namesake. Weaver’s Needle, a prominent landmark and rock climbing destination set behind and to the east of Superstition Mountain, is a tall erosional remnant that plays a significant role in the legend of the Lost Duchman’s gold mine. Peralta Caynon, on the northeast side of Superstition Mountain, contains a popular trail that leads up to Freemont Saddle, which provides a very picturesque view of Weaver’s Needle. Miner’s Needle is another prominent formation in the wilderness and a popular hiking destination. As with most of the terrain surrounding the Phoenix metropolitan area, the Superstition Mountains have a desert climate, with high summer temperatures and a handful of perennial sources of water. The altitude in the more remote, eastern portion of the wilderness is higher than the western portion, which lowers temperatures slightly. Numerous hiking trails cross the mountains from multiple access points, including the Peralta Trailhead, the most popular. The Lost Dutchman State Park, located on the west side of Superstition Mountain, includes several short walking trails. The Superstition Mountains are bounded roughly by U.S. Route 60 on the south, State Route 88 on the northwest, and State Route 188 on the northeast. We offer Balloon rides in the area under a seasonal conditions. 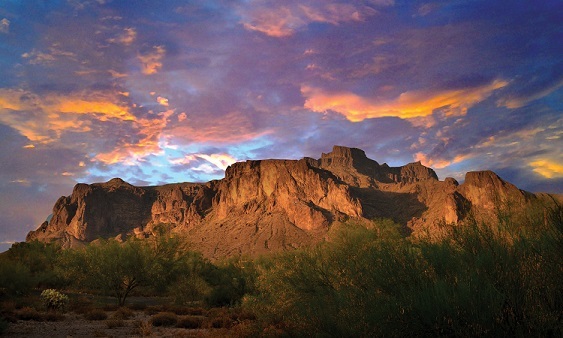 The legend of the Lost Duchman’s gold mine centers around the Superstition Mountains. 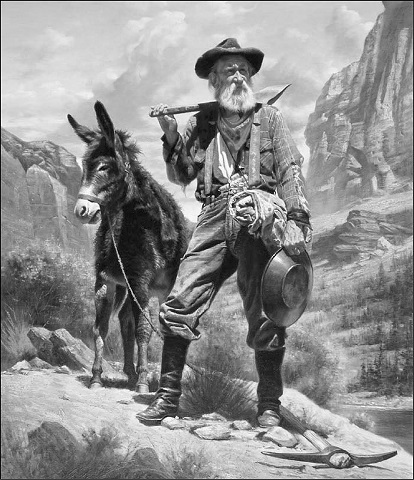 According to the legend, a German immigrant named Jacob Waltz (some sources offer other spellings of his last name, such as “Walz”) discovered a Mother Lode in the Superstition Wilderness and revealed its location on his deathbed in 1891 to Julia Thomas, a woman who had taken care of him for many years. Several mines have been claimed to be the actual mine that Waltz discovered, but none of those claims have been verified. The Peralta Stones were discovered near the Superstition Wilderness and appear to contain a cryptic treasure map, although their authenticity is doubted by many researchers. Modern visitors are urged to remain on established trails when hiking the Superstitions. Since the mid-1800s, well over 100 people have died among the craggy peaks. Some of those deaths were murders associated with the fabled Lost Dutchman Mine, but others were due to falls from its breathtaking and dangerously steep precipices. The high death toll prompted Arizona state officials in 1983 to outlaw any serious mining efforts in the Superstition range. The rugged terrain, considered by many to be the roughest on Earth, is so extreme that N.A.S.A. used it to train astronauts in the early days of space travel. Take an Apache Junction Arizona Balloon Ride in the morning, and hit the trails in the evening. Call us for amazing ideas and fun things to do in Apache Junction Arizona.